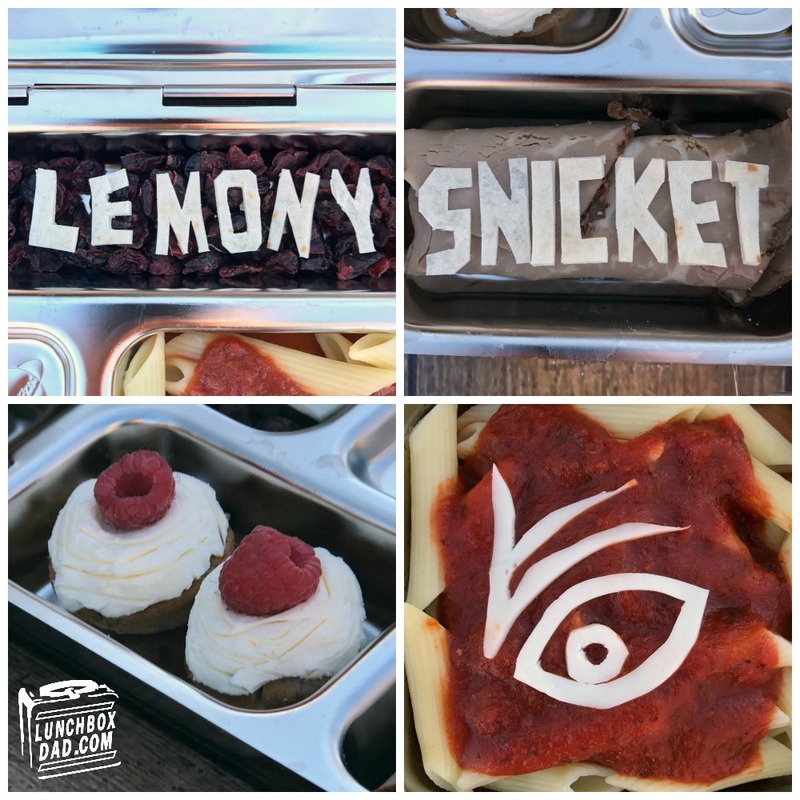 Ever since Netflix released the new Lemony Snicket's A Series of Unfortunate Events series, my kids have been obsessed with the story. My daughter even checked the books out of the school library. I didn't know much about the series, but after watching the first few episodes I am pretty impressed with the series. The way it was shot is dark, and the story really draws you in. The humor is subtle but entertaining. However, if you are looking for a feel-good show, this probably isn't it. After all, it is called "A Series of Unfortunate Events." I've come to learn that in this series, food is pretty much a supporting actor. 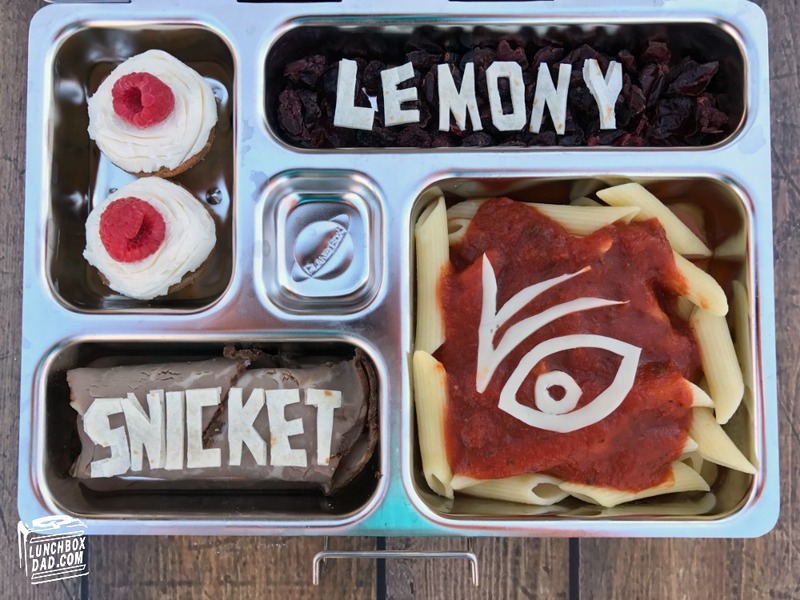 Since it is so prominent, I thought I would make my kids a lunch based on the food from the first few epsiodes. 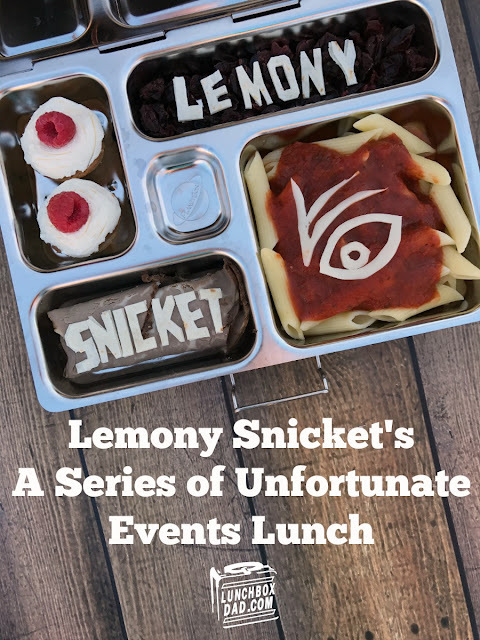 I'm sure as we move along, there will be more lunches from this story, but almost everything in this lunch is symbolic of something from the series. Pasta Puttanesca was the meal that the Baudelaire orphans made for Count Olaf, who "adopted" them. It was actually made for the Count and all of his friends for a dinner party. However, he was not impressed. After they worked for hours and served the meal, he was furious that they didn't make roast beef. This is why I made pasta with sauce and a side of roast beef. This isn't quite Puttanesca sauce, but my kids wouldn't appreciate such a fancy recipe. It's plain old marinara sauce, but they will get the hint and probably enjoy it more this way. I cut the eye symbol out of white cheese. It is a logo in the show and the books that is of great importance. An episode or two into the show, the evil Count Olaf gives the orphans raspberry cupcakes to makeup for something. They don't fall for it. I had no choice but to include these as well! All I did was spread some cream cheese on top of mini muffins and place a raspberry on top. It was so easy to make when you don't want to include a cupcake and frosting in a school lunch. The last part of the lunch was spelling out Lemony Snicket using tortilla. For the Lemony background I just used dried cranberries. They don't symbolize anything but they were all I had on hand today. I made the lunch in a Planetbox lunchbox. If you are looking for a new series to watch with your older kids (mine are 6 and 10), or a series to read with your kids, this is one to check out for sure. If your kids are already fans of the story, try making this lunch for them, they will love it! I am a member of the Netflix Stream Team. I have not been compensated for this post and all opinions are solely my own.